With improved connectivity and infrastructure, Australia is becoming closer to the rest of the world, and now cities such as Canberra and Hobart are benefiting, as well as Sydney and Melbourne, according to Knight Frank. Berlin made first place on The Knight Frank Global Residential Cities Index with growth of 20.5 per cent in 2017. Hobart has leaped from 34th place on The Knight Frank Global Residential Cities Index, to 11th place, with 13.1 per cent growth recorded in 2017. The index, which ranks 150 global cities by growth in residential property prices, places Berlin in top place with 20.5 per cent growth. Melbourne came in 21st position, with 10.2 per cent growth for the year, while Sydney, which previously led the Australian cities, languished in 83rd place, recording growth of only 3.8 per cent. Even Canberra was ahead of Sydney, in 59th place with 5.7 per cent growth. 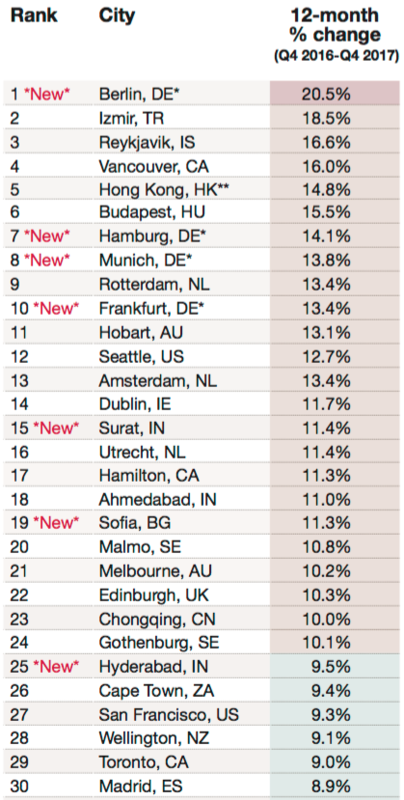 Source: Knight Frank Global Cities Index. Average global prices strengthened by 4.5 per cent in 2017, down from 7 per cent growth in 2016. Adelaide was in 87th place on the index with 3.6 per cent growth, while Brisbane made it to 100th place with 2.1% price growth. Knight Frank’s Head of Residential Research, Australia, Michelle Ciesielski, said the results mark a clear shift in the Australian property market. “There is a clear differentiation in the pace of property growth around Australia, with Sydney and Melbourne seeing prices moving towards a more sustainable level of growth," she said. “The influence by the Australian Prudential Regulatory Authority on the lending environment has certainly been felt with many investors retracting from the market on the east coast. "This risk-adverse environment is likely to remain for some time given the current banking royal commission," she said. Knight Frank’s Head of Residential, Australia, Sarah Harding, said, “With improvements to connectivity and infrastructure Australia is becoming closer to the rest of the world. As a result we are seeing more global citizens reside in Australia as well as expats returning home. “As the figures represent it is not only the major cities of Sydney and Melbourne who benefit, but the impact is now showing in cities such as Canberra and Hobart," she said. Click here to read the Knight Frank Global Residential Cities Index report.